Why doesn’t Jeff Rense want you to examine the evidence for yourself? If Stone’s report is so ridiculous, you’d think Rense would want to expose its absurdity. If Stone’s report is such an easy target, why has no one bothered to debunk it, point by point? Former NSA analyst, Jim Stone, argues that there was no mag 9.0 earthquake. The tsunami was caused by nuclear bombs in the sea and the Fukushima explosion and meltdown was caused by mini-nukes hidden in cameras installed by an Israeli security firm. The motive: punish Japan for offering to enrich Iranian uranium and straying from Illuminati diktat. This website reserves judgment but offers this introduction by James Farganne in the spirit of free discussion. When we compare the 6.8-magnitude earthquake which devastated Kobe, Japan January 17, 1995 with Fukushima, the evidence does not stack up. A quick Google Images search of Kobe reveals incredible destruction of buildings, bridges, elevated highways, and other infrastructure. The Fukushima quake, magnitude 9.0, struck about 70 km off the coast of Japan on March 11, 2011. It sent a 15-meter tsunami crashing over perfectly undamaged bridges, houses, roads, and cars — over a populace which had not been warned of the incoming tsunami, because there was no mag 9.0 earthquake. They were taken completely off-guard. Yet helicopters were waiting, and people all over Japan got to watch the tsunami roll in on live TV. What on earth was going on? Ordinarily, the Japanese people are warned of tsunamis. Why weren’t they warned? Why was there no structural damage, no reason for them to suspect that a tsunami was coming? The quake must have seemed like nothing special to a nation of people who are used to quakes. In a video taken in one Tokyo newsroom during the Fukushima quake, staff were seen to continue typing at their computer stations, totally unfazed by it. A 9.0-magnitude earthquake is more than 100 times stronger than a 6.8. A 9.0 should have devastated everything within a 1,000-km radius. There should have been widespread urban carnage, even worse than what Kobe suffered. Yet the Fukushima quake of 3/11/11 did not cause a single structure to collapse. But don’t take my word for it. Go look up the helicopter footage on YouTube. Look at the infrastructure the tsunami was crashing onto. Not the slightest bit of damage. Common sense is enough to make you wonder. Jim Stone did more than wonder. He dug up and analyzed the Japanese seismograms. He proved there was no 9.0 quake, and no epicenter out at sea. Instead, there were three simultaneous quakes of much lesser magnitude, all of them inland. The authorities lied about the 9.0 quake — made it up out of whole cloth. An earthquake did not cause the tsunami. There must have been another cause. It turns out that the official explanation for the Fukushima reactor explosions was bogus as well. 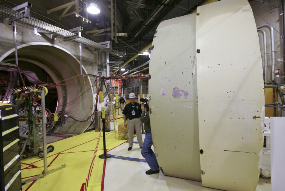 Nuclear power containment walls are extremely thick and strong. Hydrogen explosions could never have destroyed them. As a historical reference, hydrogen explosions occurred at Three Mile Island and caused no structural damage, nor even any injuries to plant personnel. Furthermore, Reactor Four contained no fuel on 3/11/11, and was therefore nonoperational — yet it exploded and was destroyed as completely as were the other reactors that day. 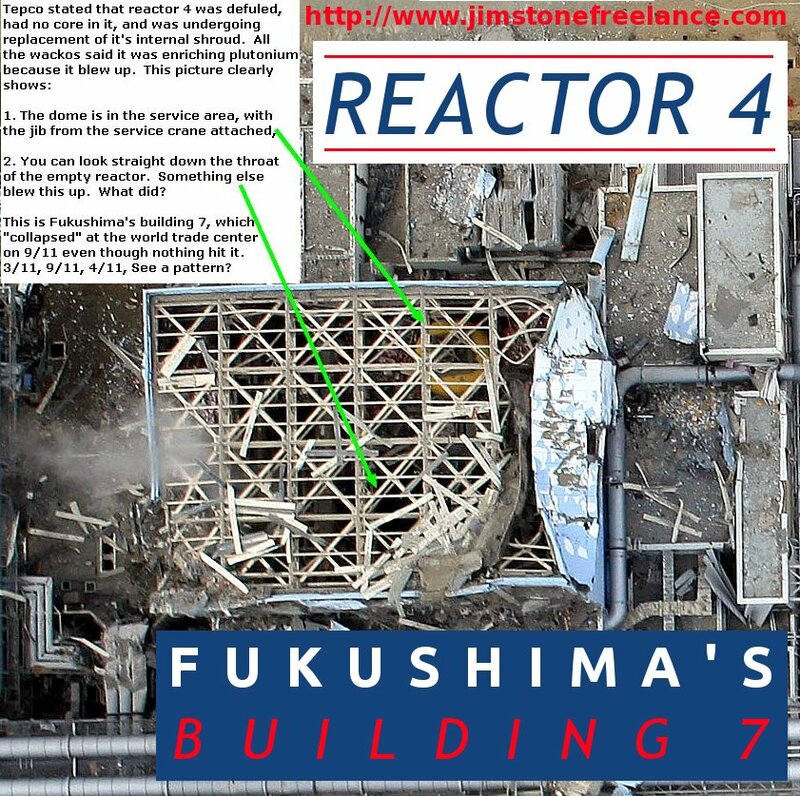 Reactor Four is like Building 7 at the World Trade Center – an utter impossibility, a blatant smoking gun. A reactor containing no fuel cannot operate; a nonoperational reactor cannot explode unless someone explodes it. The destruction of Reactor Four can only have been the result of sabotage. In February 2010, Japan offered to enrich uranium for Iran. Soon thereafter, an Israeli firm by the name of Magna BSP secured a contract to run security at the Fukushima Daiichi plant. They installed oversized cameras strongly resembling gun-type nuclear weapons. There is strong evidence that they planted Stuxnet, an Israeli computer virus that attacks Siemens power plant control systems, and which Israel previously used to damage Iran’s nuclear program. Magna BSP also established internet data links in the reactor cores, in blatant violation of international nuclear regulations. All twelve members of that security team returned to Israel in the week before 3/11/11. In the aftermath of the disaster, the Israelis publicly monitored the reactor cores via their illegal internet data links. Yet no one took them to task for this. What caused the tsunami? What destroyed the reactors? Using skills honed as a former NSA analyst with an engineering background, Jim Stone concluded that Israel was behind the destruction of Fukushima Daiichi. Now he is paying the price. Stone proved that there was no 9.0-magnitude quake to cause the tsunami. The tsunami must have been artificially induced, perhaps by an atomic bomb placed in the Japan Trench. The tsunami was blamed for flooding the reactors and causing the explosions. But Stone presents compelling evidence that Israel destroyed the Fukushima Daiichi plant by installing gun-type nuclear weapons in the guise of security cameras, and then setting them off in the tsunami’s aftermath. Stone demonstrates that the Stuxnet virus continues to distort sensor readings at the disaster site to this day. Unlike many others in the world of whistle blowers, Stone bases his conclusions on hard evidence and unassailable logic. Anyone can review and challenge his work. He is open to it. Since releasing his report and making several radio appearances to support it, Jim Stone has been harassed, threatened, unlawfully detained, and is currently facing prison time on completely trumped-up charges. I have watched the reaction to his work on the net. Some have slandered him. Others have railroaded his work. No one has debunked him yet. His conclusions have ramifications that make 9/11 pale in significance. Why, all across the alternative media, this roaring silence on the work of Jim Stone? Why haven’t more truth sites simply linked to his report, directing people to review the evidence and decide for themselves? Some have expressed suspicion that Stone might not be what he claims to be. That’s irrelevant. Facts are facts. The report stands on facts. If you haven’t done so yet, I urge you to study Jim Stone’s Fukushima report. It is well worth the considerable time and effort. Then, if you agree that his conclusions are correct, please do your part in spreading this information and dispelling the alternative media’s silence on it. To conclude, a 9.0-magnitude earthquake never happened in Japan on 3/11; the tsunami must have been artificially induced. Nor did hydrogen explosions obliterate containment walls of concrete and rebar several feet thick. The official story is impossible. Israel was punishing Japan, and Zionist operatives now are attempting to destroy Jim Stone, the man who exposed the truth.